That's a lot of skin-tight robot suits. What is the only thing PS4 users are more into than robot-suited warriors slicing aliens into teensy bits? Well, Netflix, obviously, because every living being on the planet owns a Netflix account. PS4 fans are pretty psyched about Warframe if Digital Extreme's claims are to be believed. The free to play co-op shooter is currently the second most downloaded app on the Playstation 4 Store. While Sony hasn't dished out the exact numbers yet, they have commented it is more than two million downloads, with over seven million systems sold. 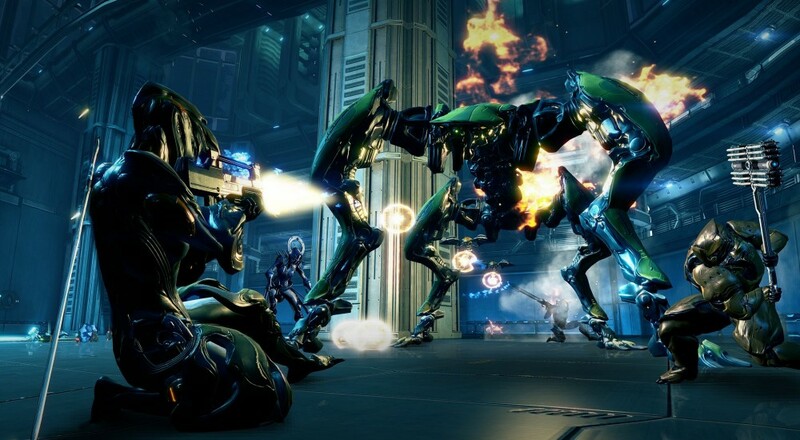 Earlier this month, Digital Extremes dished out Update 13 to Warframe on the PS4. Take a look at some of the Devs bragging on their new features. With the new consoles still in their relative infancy, ports have stepped up to fill the gap in new IPs. No matter your thoughts on free-to-play games, F2P titles like Warframe do offer a slightly more compelling reason to invest in a brand new console with very few desirable titles at the ready. Instead of forking over $400 for a brand new system and then an additional $60 per game, users can ease into the new gen without spending an extra dime on software. Page created in 0.2789 seconds.